It’s not a good feeling that you have to work over the weekend, work life balance is somewhat hard to achieve here in Hong Kong. I try hard not to work over the weekend, but sometimes you just could not avoid it. It took me few hours to convince myself and move my arse, sitting in front of the computer and start working. It would be nice to have a glass of something to keep me company, since it’s already 5 o’clock, perfect time for a cocktail. Or I would consider its already a bit late, as we should start drinking during brunch on a Sunday. Sangria is something good to have during Summer time, that fruity sweety feel would just cheer you up in a hot Summer time, bring me back the feeling of watching sunset at the Cafe del Mar in Ibiza… day dreaming…. 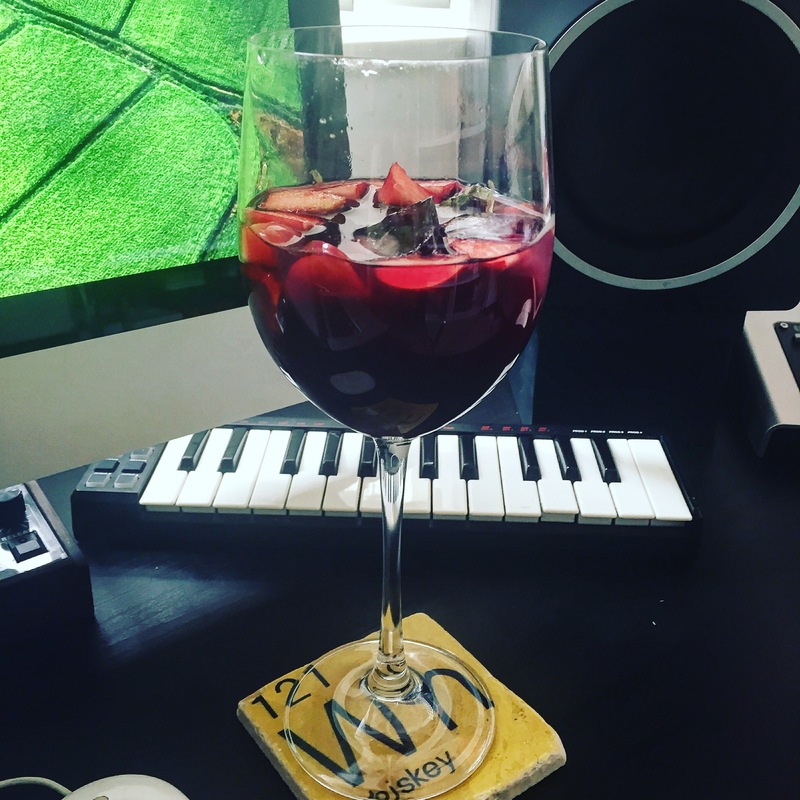 How to make a Sangria? It’s pretty simple. All you need is fruit, rum, brown sugar, orange juice or juice that you like and red wine. The most important thing is, the Sangria has to been cold enough. So, I would suggest, the trick is to keep all the ingredients in the fringe for at least one or two hours before making the Sangria. In that way, you can make sure the drink will be chill enough. On the other hand, you better get a 1 Litre container or pitcher that can fit into your fringe, so that you can keep the ready made one always chill before you can finish it. First of all, chop half orange and half apple into small cubes and place them into the pitcher. You can add or change to the kind of fruits that you like, but somehow the apple and orange kind of balance out the taste. Add 4 teaspoon of brown sugar into the pitcher and kind of smash them and mix them for one minute, then pour 80ml of rum into it, and mix them well. Then, add 200ml of orange juice into it, or the kind of juice that you like, something mixed like orange & passion fruit, mandarin & mango will also works well. Finally, add a full bottle of 750ml red wine into the pitcher, of course no need to use a nice bottle of red wine. Just something cheap and cheerful that will do. I like to serve it with more ice cubes, in order to have the really cool and chill feeling.